Before you scarf down a tube of high-calorie cookie dough, check out our latest creation. 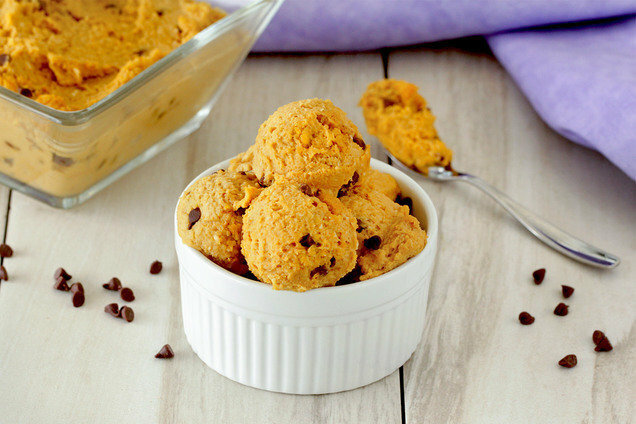 It's made with a healthy secret ingredient that adds major protein: chickpeas! Okay, the secret's out. Don't worry... You can't even taste 'em. Pulse oats in a food processor until reduced to the consistency of coarse flour. Add all remaining ingredients except chocolate chips. Puree until completely smooth and uniform. Fold in chocolate chips. Transfer to a medium bowl. HG FYI: Truvia spoonable no-calorie sweetener is about twice as sweet as sugar. If using a no-calorie granulated sweetener that measures cup-for-cup like sugar instead of Truvia, double the amount called for in this recipe. Hungry for More No-Cook Desserts? Who wouldn't want this recipe? Click "Send to a Friend" to share it ASAP.